I’ve always loved baseball, ever since I was a little kid. My dad goes for the Toronto Blue Jays and I follow the New York Yankees. I’ve followed the Yankees since I was 6 years old. Something I remember from when I was young is going to the baseball with my family. We use to go to Parramatta Stadium to watch the Sydney Blues. We all went. It use to be packed every game. After the Blues they became Sydney Storm and after that the ABL went bankrupt and there was no baseball but I continued to play softball and watch the Yankees. 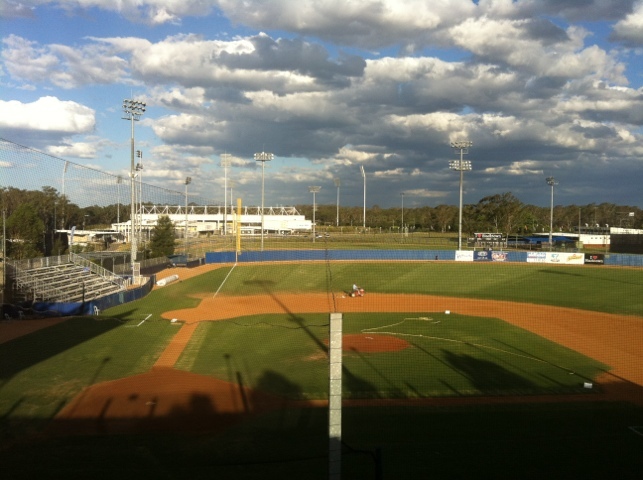 Now, they’re the Sydney Blue Sox and the ABL is owned by the American MLB. People don’t come and it’s sad. I’d hate to see it close down again. For now though I still go to the games with my dad, it’s no longer a family event but it’s still a love we share. Today was spent in the city (Sydney) with one of my best friends Jayson. I have known Jayson for about 4-5 years now. We met at a part time job we were working while we were both still at University. We discovered, after a short time, that we are quite similar and thus have been friends ever since. In one of the hardest years of my life last year, Jayson was there, he’s been there through great, life changing times, and horrible, life changing times. It sounds corny, but I know that we’ll always be friends. We’ll be old grandma and grandpa listening to Triple J and watching animal documentaries together. Jays and I went into Sydney today to watch a documentary at the IMAX theatre called “Born to be Wild”. Many things made this an excellent doco, mainly that Morgan Freeman narrated it, but also that it showed two women who have spent their lives saving orphaned animals, one saving elephants in Kenya, the other saving orangutans in Borneo. Some amazing people doing amazing things and it makes me want to get out there and take some risks to help these animals. We also went into Sydney to take photos. Jays just recently got a Nikon D5100, one model up from my Nikon D5000 and wanted to test it out. Unfortunately it was quite a grey day in Sydney today, but we still had fun. We rode the monorail, many times, got annoyed at Sydney Aquarium for no longer letting teachers in free, met some nice foreigners (hey Jays?). The photo is Jays on the monorail, you can see Centrepoint Tower (which I think it’s now commercialised state is called Sydney Tower) in the background. All in all it was a great day, and I’m exhausted. We’re heading to Taronga Zoo in a few weeks to take more photos so stay tuned. With a temperature of 35 degrees (95 degrees fahrenheit for the U.S readers), today was a day to stay indoors, in air conditioning, watching trashy t.v. Mel and I’s choice? Toddlers in Tiaras. I have never actually watched an episode of this show before, but Mel has seen it, and I must say I was shocked, and weirded out, as well as a little confused as I do not understand the jargon that comes with the world of kiddy pageants. As you can see from the image, it was a Western themed pageant today, wow. I don’t know what else to say, except that my favourite quote from the advertisement for this show is a lady who is talking about how high the girls hair can be in these things and she says “The higher your hair, the closer you are to God, I call it Jackin’ it to Jesus.” That is possibly the most hilarious quote ever and it is whipped out anytime these shows come on. You can also see how unimpressed my dog happens to be with the current heat in Sydney. Rambo does not do well with heat, and that’s him chillin’ out under the air conditioner. Oh and we still have our Christmas decorations up, yep, it’s how we roll. How did you spend day 4? Were you dying of heat exhaustion too? As a side note, it does get much hotter here where I live, but we haven’t had much of a summer yet so the 35 degrees today was quite a shock to the system, especially since this time last year, I was in -17 degrees in Germany, not use to the Aussie summer. Today was spent with two of my oldest friends Jen and Audrey and my little one, Audrey’s daughter Arabella. We had lunch at the Sydney Fish Markets. I met Jen on my first day of year 7, 13 years ago. I asked if I could sit with her in Science and she said yes. We have been friends ever since. Audrey and I met later that year, and I must say, it was a much rockier beginning to our friendship, but we managed to get it sorted and the three of us have remained close friends throughout the changes in all of our lives. I appreciate good friends, and old friends, it’s important to keep close those who know who you are now, and who you used to be. It’s been a long time, I shouldn’t have left you. There’s been a lot going on lately. In the past weeks which I have been absent from this here blog I have done many many things. I have been to a halloween party, two exhibitions and partied the weekend away in the city. Let’s start at the beginning.